Minister Moshe Ya'alon (Likud) meets four members from Kadima, shows them the outline of the new draft law he is preparing. Minister Moshe Ya'alon (Likud) met on Friday with MK Avi Dichter and four other Knesset members from Kadima, and showed to them the outline of the alternative to the Tal Law which he is planning to bring up to a vote in the Knesset. According to Channel 10 News, Dichter initiated the meeting and it was also attended by MKs Otniel Schneller, Yulia Shamalov-Berkovich, Doron Avital and Yaakov Edri. The meeting came three days after Kadima chairman Shaul Mofaz announced his party is leaving the coalition because of what he said was Prime Minister Binyamin Netanyahu’s failure to live up a supposed agreement on changes in the draft law. During Friday’s meeting, Ya'alon told the Kadima Knesset members that he was disappointed with Mofaz's decision to leave the coalition before an alternative law was drafted. 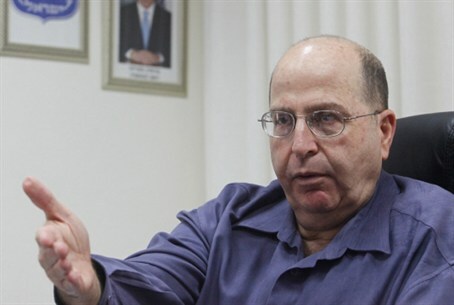 Ya’alon told them that Kadima's withdrawal from the government was a political move rather than a moved based on values. Mofaz joined the coalition in early May, making a “universal draft” the party’s main platform. A committee headed by Kadima MK Yohanan Plesner discussed proposed legislation to replace the Tal Law, which expires on August 1, but MKs from several parties who opposed the committee's conclusions left the panel. Netanyahu dissolved the committee, arousing the ire of Mofaz, who the following day brought out Plesner to announce the proposals. The suggested legislation concentrated on hareidi religious youth, with heavy sanction against those refuse, while only vaguely relating to the Arab sector. A working group that followed the Plesner Committee was headed by Ya'alon together with Plesner, and was intended to find a compromise to keep Kadima in the coalition. However, the two failed to come up with an agreed upon alternative, and Kadima officials charged that Ya’alon withdrew from agreements reached between the two parties so far on the new draft law. Ya’alon in turn argued that Plesner was looking to start a war with the hareidim. Following Friday’s meeting, Ya'alon told the Kadima MKs they are welcome to approach him on any matter. “My door is open to you,” he was quoted by Channel 10 as having said. Channel 10 noted that the meeting is especially interesting in light of recent speculations that Kadima may split in two as a result of the withdrawal from the coalition, with some members who were not satisfied with Mofaz’s conduct joining the Likud party. On Wednesday, the Knesset killed a bill that would have mandated universal military service for all Israelis at age 18 – including Arabs and hareidi-religious citizens – by a vote of 74 to 22. The bill from Foreign Minister Avigdor Lieberman's Yisrael Beytenu party would have made those who refuse to serve in the army or perform national service ineligible for funding from the State.